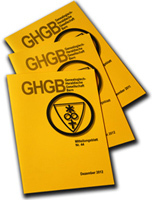 Since 1990 the GHGB has published a bulletin twice a year which is free to all the members of our society. The publication has an edition of 350 copies with about 44 pages. All publications are held at the Swiss National Library and the Stadt- und Universitätsbibliothek Bern. Past publications may be ordered if still in stock at the webmaster. Or as DVD: Mitteilungsblätter GHGB, Heft 1/1990 bis Heft 52/2016; Preis Fr. 20.-.